Forewarned! 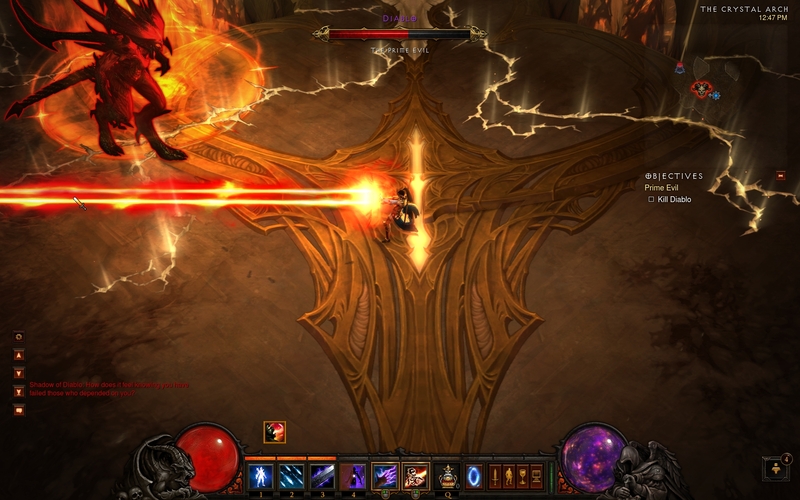 Its been a little over a week since the release of Diablo 3, which over the past week, has sent millions of people away from other games and out into the world of Sanctuary. Only this time there is another level of hell to get through in the Inferno. The game saw the addition of some new evils, such as Bashiok, Thrall of Azmodan or Zarhym, Terror of the Grave, but also some old classic monsters including Diablo himself and this guy who first made his debut way back in 1995. The Butcher! And my Wizard in Archon form. Even after only a brief week of the game being released, I can already tell what I like about the game, and what I do not like about the game. 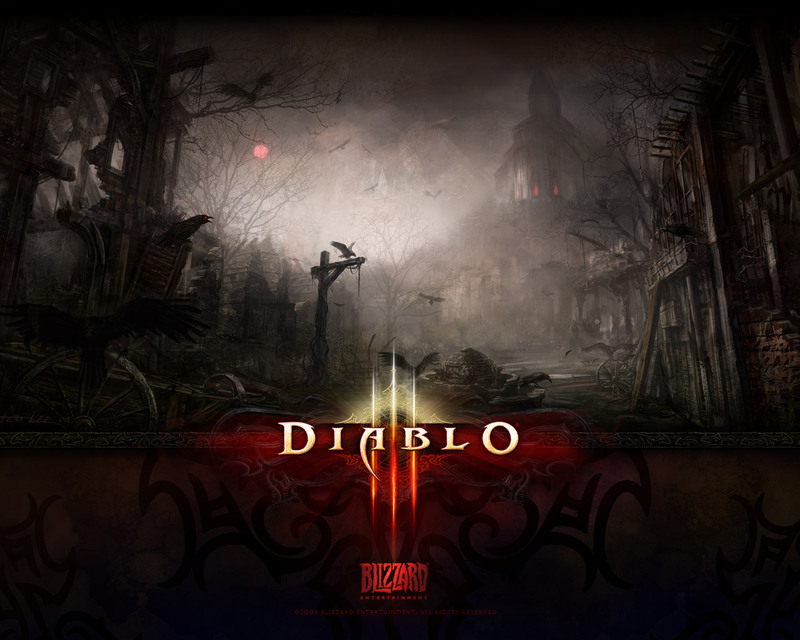 The game is not WoW and plays completely different from WoW. With the exception of perhaps an in game auction house (one day perhaps?) to streamline sales. They made gold have relevance again. Unlike in Diablo 2 where people would be gold capped on damn near every toon they made because other things were used for currency. The game is challenging when you hit the end of Nightmare and Start of Hell Difficulty. 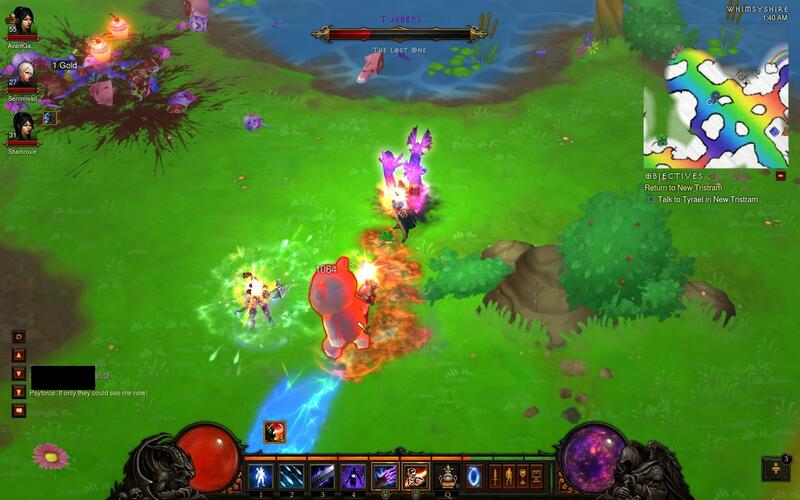 You can brute force your way through the normal mobs, but the elites provide a challenge all of their own. A decent storyline, albeit with a predictable ending, and an easter egg. New elite attributes aside from Fire/Cold/Lightning/Aura Enchanted and Stone Skin. The damage scaling system. Instead of synergy (which was integrated much later in Diablo 2, not at its launch), damage is modified by the weapon (even for casters) and scales with your character’s primary attribute and + damage items and gems. Your mercenaries and companions have some dialogue. Which is a nice interjection between the carnage every now and then. Just don’t pair up your wizard with an enchantress and then find the enchantress again in act 2…… er…. unless of course you are into that stuff! Elites are infused with rabies. And by this I mean, you may find yourself legitimately screwed if you run into a combination like, I don’t know, Mortar + Frozen + Nightmarish (fear) + Jailer. Lack of Gems and No Runes/Runewords. I am not terribly impressed with the variety of options of what gems do, nor the fact there are no runes or normal socketed body armors/weapons to make rune words. I am guessing this is to prevent runes and runewords to become the standard of currency again. You trudge through the acts, encounter a ton of new bestiary, new fortifications that the evil forces are driven to overtake and claim as a permanent outpost of hell, and new parts of Sanctuary. And you conquer your way through it all! To reach the apex, the summit, the pinnacle of heaven where your final test awaits. For some reason, I really like the final room. While its set in a divine and ascended matter, the tinge and crumbling debris help give it a nice battle tested setting. They also used the same model as the final area where you fight Diablo in Diablo 2, only the Star of David is omitted (to avoid any possible religious snafu). And then just like that, its over. The worlds of Heaven and Earth are saved (again) by a mortal entity, but surely there must be something else out there to enjoy as a reward for the fruits of our labor. The heroes and heroines scour the world fervently for this place, where cows and ponies and humans can all coexist in harmony, peace. 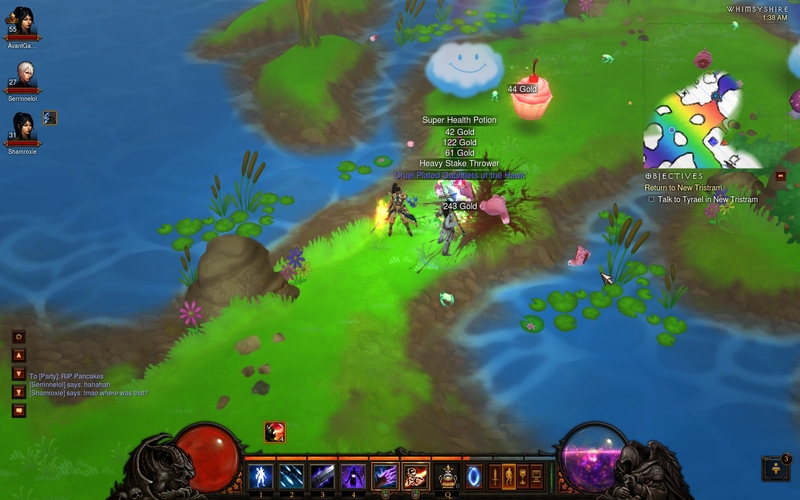 Where cupcakes are found a plenty, the water gives birth to a vibrant plethora of rainbows, and cuddle bears and sunflowers illuminate the land. And the heroes seek out this place. All in the name of merciless carnage. 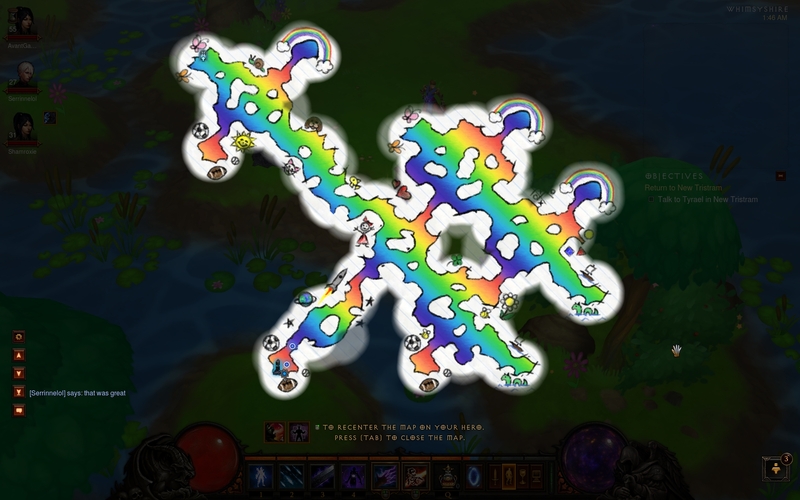 Yes, blizzard has come through, with perhaps its best trolling of its players to date, by releasing its own revamped version of “the secret cow level”. Much like in Diablo 2, you need to gather a few crafting materials to get to this secret level. 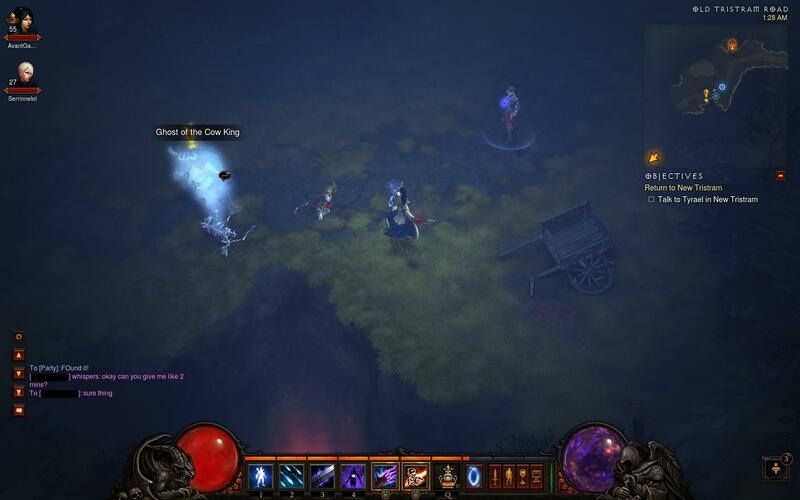 They made it much more difficult to get the items in Diablo 3, a lot of cases you have to wait for a rare layout to spawn as the map, with a rare spawn enemy in that map, who has a (you guessed it) very rare chance to drop the crafting reagent you need to make the item. And well, after you get the item… I will just let the screenshots do the talking here. I too am Udderly pleased if you have taken the time to read this, as well as the puns…. 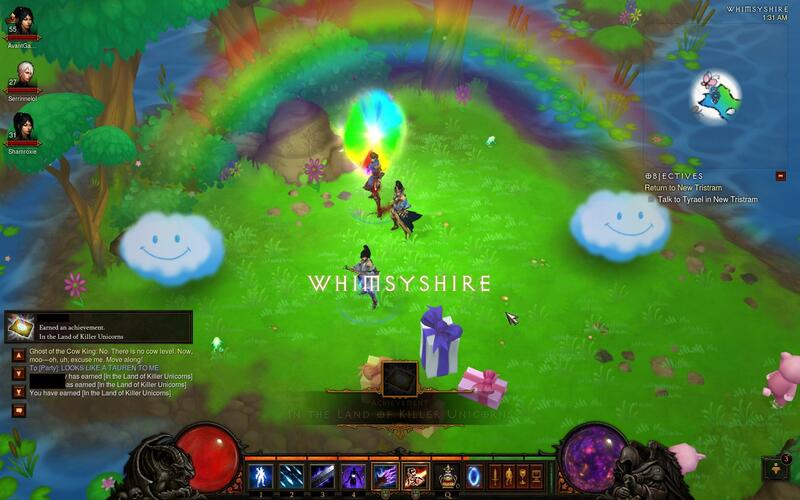 so many puns…..
Whimsyshire, and you thought Disney was the place where dreams came true. I Knew someone doodled this level in the middle of Physics class! Who wants CUPCAKES!? Also pancakes are dead, so you know. I guess I should, you know include a shot with ponies and bears BEING MERCILESSLY SLAUGHTERED too, right? All Hail the teddy bear overlord! Overall the game is a solid 9 in my books for what I have seen in the first week, opinions certainly vary! 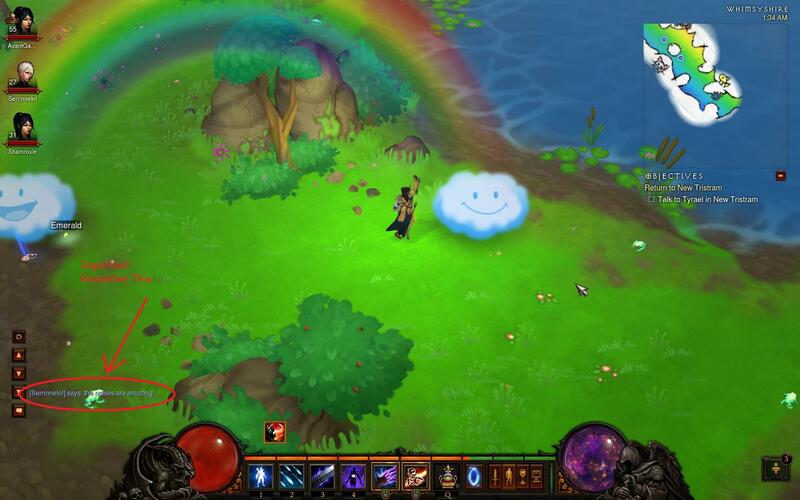 I do know that you got me good blizzard, thank you for trolling the heck out of me with that Easter egg level. If you have played the game, in its entirety, what do you think of the game? Did you enjoy what was put into in by the May 15th release date, or did it come up short of what you were expecting? And most importantly, did you enjoy the secret pony level, with all the sounds and warped machinations of what they passed of as music? The world is saved! 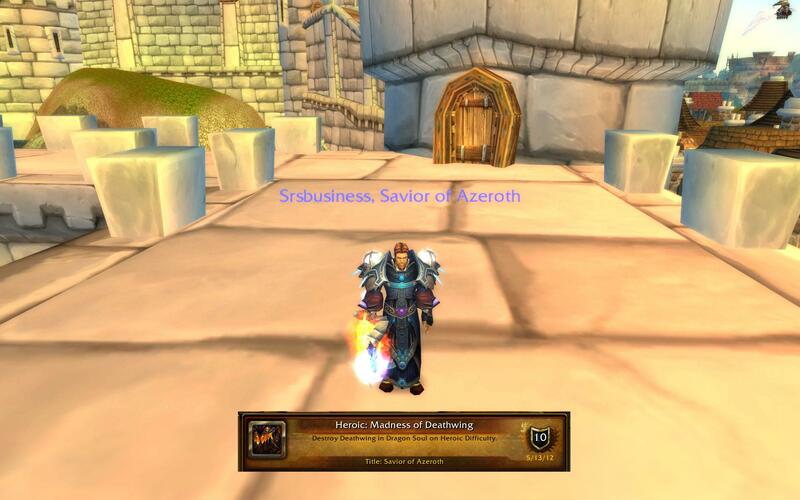 Evil no longer reigns over Azeroth as on May 13, 2012, Apotheosis of ET successfully cleared the Heroic Madness of Deathwing encounter, being the first and only guild on our realm to do so on 25 man difficulty. The fight took considerably less time to conquer than the previous fight on Spine of Deathwing, but the duration of the encounter is what can take a toll on your night of attempts/kills. Our kill took almost 14 minutes, compared with some other fights in the zone which take less than 5. Speaking of which, if you are a skilled dps and want to be a part of our team as we continue to save the world in the near future and going forward into Mists of Pandaria, you should check us out over at Apotheosis! The elements of the fight are still relatively the same on heroic, however, there is the addition of two new elements, the Corrupting Parasite and Congealing Bloods that the raid will have to contend with. Kind of like how one has to contend with a particular group of in-laws friend who plays music really loud in the car that may rub them the wrong way. Corrupting Parasite – Affixes itself to a random (non-tank) raid member, dealing increasing fire damage over 10 seconds before exploding from the host. The parasite has roughly 9 million health and will deal 10% of its remaining HP to everyone in the raid if not killed. Basically, if you ignore this, it will explode and hit you for 900k if not killed. With a 20% nerf, this has about 7.2M hp now, and you should get about 2 parasites per aspect platform unless your dps manages to get the tentacle down quick enough. Congealing Blood – Once you get to the final stage of the Deathwing encounter, he will start to periodically increase his fire damage to you based on his remaining health. At 15%, 10% and 5% he will spawn a set of 10 congealing blood at one of three random spots on that platform. Each blood that gets to him heals him for 1% of his total HP, and if he is healed over one of those percentage indicators, he will spawn another set of bloods. They can be slowed, but not stunned or knocked back, heavy aoe and spellweave cleave should kill all 10 of them before they get to the boss. Raid damage also tends to get very high at the end, liberal usage of your dream will help at the end. And for our kill, most players used it between 3 to 4 times on the platform, some as many as 8 times, which made all of our healers very happy. As a shadow priest, you will really like this fight. There is always at least 2-3 things to apply dots to, your talents let you mitigate the most incoming fire damage possible, and when blood are our you get to unleash your twisty ribbons of face melty destruction upon them. Getting to the last 5% starts to get the adrenaline running, you see his health fall below 2% thinking you have the encounter beat, when suddenly you see 6 bloods racing towards him about to heal him…. and then suddenly………! 25 people went into the Dragon Soul, 25 people came out of the Dragon Soul. Congratulations! I am completely stoked about the upcoming challenge, and at the same time proud of what the team of a 25 man guild has accomplished in the past month in WoW. To my guild folks, how does getting through all that content finally feel after what seemed like beating our heads off the wall some nights? And for everyone who reads, are you ready to lend spell or sword to the evil thats 11 years in the making?